National Bargaining is on, and the 85,000 members of our Coalition of KP Unions are facing our toughest fight in decades. The futures of our patients, our families, and Kaiser are at stake. Here’s what you need to know as we head to the bargaining table. CLICK HERE to join our FB group! 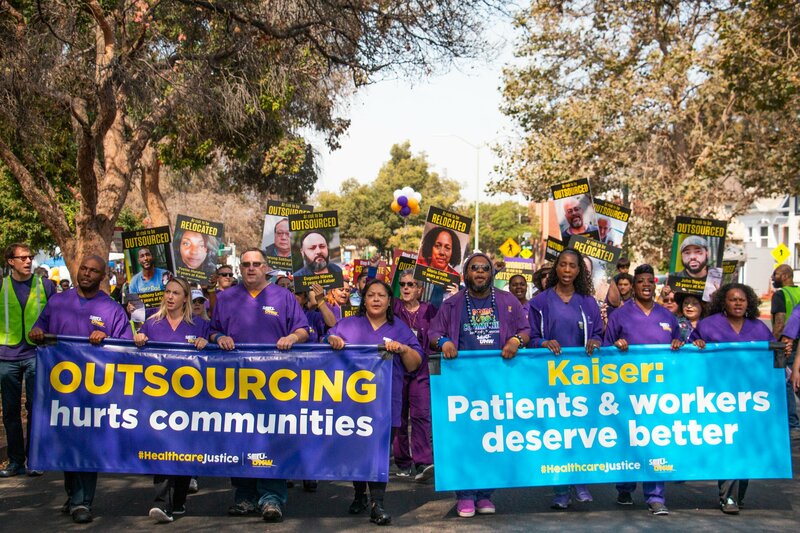 Kaiser has agreed to resume National Bargaining without pre-conditions. This is the result of our actions in facilities across the state, our political pressure, and our legal challenges to Kaiser's refusal to bargain. We fought hard to get here, but the REAL fight starts now. To win a great contract we need to be 100% united behind our bargaining team — and to show that unity and power every day in our facilities. The futures of our patients, our families, and Kaiser Permanente. Kaiser executives want a future where corporate profits are the top priority. They are pushing hard to raise our healthcare copays, lower our raises, outsource and automate our jobs, and stop us from speaking out for our patients. We’re fighting for a future where affordable, compassionate patient care and good healthcare jobs come first. That's the Kaiser we once knew, but Kaiser has lost its way. Now it’s up to us to get them back on track by winning a contract that protects our families and our patients. What are our bargaining priorities? Now that we’re going back to bargaining, what happens to the U.S. government’s charges against Kaiser for refusing to bargain and trying to force a gag order on us? We are pursuing our case. Kaiser will try to get out of the charges by saying they are now bargaining with us. But Kaiser broke the law and we will ensure that Kaiser executives are held accountable. The hearing is scheduled for April 22. What can I do to help win a strong contract that protects our families, our patients, and the future of Kaiser? Stay united behind our bargaining team and show it! All of us need to commit to taking action: picketing, stickering-up, marching on the boss, and even going on strike if that’s what it takes for us to win a contract that delivers on all our bargaining priorities.